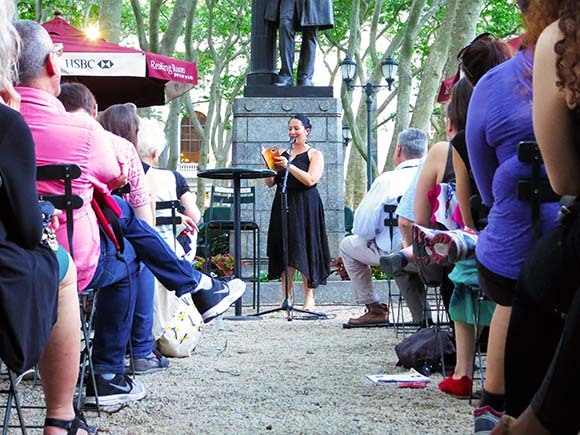 Bryant Park’s outdoor Reading Room is open for its 14th summer and the literary lineup is better than ever. This year we welcome back all of our signature series, including Celebrity Author, Non-Fiction, Poetry, Reel Talks, StoryTime, BookClub, Kids, Writers Workshop, HSBC Business & Finance, as well as the return of the crowd favorite Spelling Bee. We’re excited to introduce two new series, Coffee & Crosswords and Game of Thrones BookClub, and will be hosting our first Crossword Tournament in the park. Over 100 events will take place in the Reading Room this summer, and visitors are always welcome to use of our daily newspapers, magazine, and book carts. Below are a few of the programs we're looking forward to this month. Poet Ada Limon doing a reading at May's Reading Room Poetry event. CNN’s Tom Foreman will lead a panel discussion about the art of writing a memoir. Featured panelists will include Supermodel Pat Cleveland, the editor of Tin House Magazine, Rob Spillman, and Executive Writer for Men's Health, Eric Spitznagel who will take cues from their own memoirs, Walking With The Muse, All Tomorrow’s Parties, and Old Records Never Die: One Man’s Quest for His Vinyl and his Past, respectively. Our HSBC series is focusing on the state business and finance in the new economy, with this week's program focusing on start-ups. Evan Baehr and Evan Loomis will discuss finding financing for your ventures and talking about their book Get Backed: Craft Your Story, Build the Perfect Pitch Deck, and Launch the Venture of Your Dreams. Venture Capitalist Patrick J. McGinnis will lead a discussion about following your start-up dream and stability with his book The 10% Entrepreneur: Live Your Startup Dream Without Quitting Your Day Job. This week's Poetry event is presented in partnership with Kundiman, who curate arts programming where Asian American writers can explore the challenges of a new and ever changing diaspora through art. Featuring poets: Janine Joseph, Patrick Rosal, Jee Leong Koh, Franny Choi.